Why Won't McAuliffe Say No to Dirty Coal? I spent a lot of time thinking about which candidate to support in the Democratic primary for Virginia governor. I was on the fence until Terry McAuliffe pushed me off with his refusal to say no to the proposed massive new $6 billion coal-fired power plant in Surry. Brian Moran may have stayed quiet through the debate about the new coal-fired power plant in Wise County, but on Surry, he's taking a clear stand against it. You can watch my full clip on Why "Clean" Coal is Like Dragons & Leprechauns at my YouTube channel. In early 2005, Gamesa, a Spanish wind-technology corporation, located its first North American plant just outside Pittsburgh. The company has since expanded its Pennsylvania presence to include a Philadelphia headquarters and a second plant in Fairless Hills. Gamesa has invested more than $200 million and sustained 1,000 well-paid, career-track, green jobs in the state since January 2005 despite market swings due to the recent global credit crisis. It was no coincidence that Gamesa chose to locate its facilities in Pennsylvania. State and local government officials, workforce-development groups and organized labor set the stage with a ready market and resources to attract the company's investments. Pennsylvania's landmark state policy requiring 18 percent of the state's electricity to come from renewable sources by 2021 was a major factor in creating a favorable economic environment for the wind turbines that Gamesa produces. Key to Gamesa's success in Pennsylvania has been its innovative partnership with the United Steelworkers of America. We are proud to be at the forefront of America's new energy economy, creating sustainable power and family-sustaining jobs with benefits. Our successful partnership in the state rebuts what, until recently, had been the conventional wisdom that enacting strong environmental standards would require economic sacrifices. Together, Gamesa and the United Steelworkers have proven that policies to curb CO2 emissions and invest in clean energy can help turn Pennsylvania, a state once plagued by economic demise and plant closings, into a national model of how to rebuild our economy and create high-paying, secure jobs for the future. Why not Virginia, too? The only thing standing in our way is the political leadership to make it happen. Right now there’s a critical labor question facing Americans: Do you believe it should be easier for workers to organize into a union to fight for better working conditions? That’s the question at the heart of the Employee Free Choice Act, yet it’s completely ignored in most media discussion of the bill. Instead, reporters skip right to the Republican talking points, bashing unions and claiming that any strengthening of workers’ ability to organize will be bad for everyone. No, really. The National Right to Work Committee sent out an email claiming anyone who supports the Employee Free Choice Act is selling out “employees, customers, stockholders, and fellow employers.” I’m surprised they didn’t include pets. The current process for organizing a workplace denies too many workers the ability to do so. The Employee Free Choice Act offers to make binding an alternative process under which a majority of employees can sign up to join a union. Currently, employers can choose to accept--but are not bound by law to accept--the signed decision of a majority of workers. That choice should be left up to workers and workers alone. People call the current National Labor Relations Board (NLRB) election system a secret ballot election—but in fact it's not like any democratic election held anywhere else in our society. It's really a management-controlled election process because corporations have all the power. They control the information workers can receive and routinely poison the process by intimidating, harassing, coercing and even firing people who try to organize unions. It’s a sad statement about how little we value workers’ ability to organize for a better deal that even minor process changes in union organization are met with such fierce, over-the-top resistance from big business and its allies on Capitol Hill. A local organizer from the Service Employees International Union (SEIU) has asked for our campaign’s help to let our leaders know that we support the Employee Free Choice Act. We're hosting an event on Saturday at 1pm to write Senators Warner and Webb to urge them to support it. Hope you can join us! The National Capital Region Transportation Planning Board reversed itself last week and decided to restore $75 million in funding to the region's transportation plan. Arlington will get the majority of the pollution, while residents of Fairfax, Loudoun and beyond will get any benefits that come out of it. And those benefits are dubious -- if traffic moves any faster, more drivers will just pile in from existing alternate routes. Arlington commuters would get much more benefit from investment in Metro, telecommuting, carpooling and bike trails. One day after complaining that there was room for private parking spots but no sidewalk at a construction site at Wilson & Oakland, this morning I noticed the new sidewalk has suddenly opened for business. 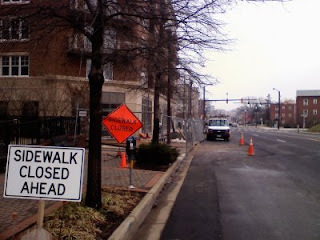 I have not heard a word from the county, but seems like a remarkable coincidence that the problem was solved less than 24 hours after the post went up (the "sidewalk closed" signs are even still hanging from the pushed-back fence). Arlington County keeps such a close eye on the net, it's now actually faster to solve a problem by posting it to a blog than it is call in a complaint. And certainly light years faster than writing a letter ever was. Amazing. As I run for House of Delegates, I've been telling voters that far from being confusing and scary, new technologies like blogs and Twitter bring us closer together than ever and make problems easier to solve. Hopefully, stories like this will make convincing them a little easier. Sidewalk Closed. Private Parking Now Available. 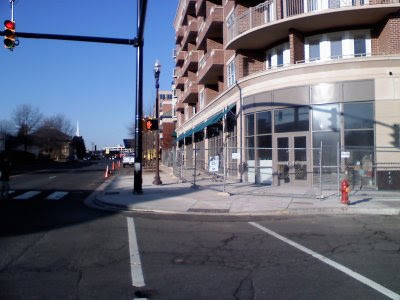 I've always been amazed that Arlington lets construction companies completely close off the sidewalk on one side of the street without providing temporary space for pedestrians to walk. It's not only unsafe, inevitably forcing pedestrians into the street or at least to cross the street outside of a crosswalk. It also flies in the face of the County's well-deserved pedestrian-friendly reputation. One stretch of Wilson Blvd. in Virginia Square has been shut down for months now. I've just been walking around the fence, but I can imagine it must be troublesome for residents of the Brighton Senior Living Center next door, who are now shut off from Oakland Park. To walk down to the next crosswalk with a signal (Quincy & Wilson) then back to the Oakland & Wilson signaled crosswalk is a half-mile round-trip. You see, there's no room for pedestrians here, but there is space for two private parking spots for the construction crew's vans. Those vans aren't there temporarily being loaded and unloaded -- they're parked there every day. In fact, these might be the only two on-street, unmetered parking spots on Wilson Blvd. from Ballston all the way to Rosslyn. Pretty primo. Just don't try to walk past. Not plain old beer filled with green dye. Organic beer. In Arlington, the best selection of organic beer can be found at Lost Dog Cafe in Westover on Washington Blvd., but Shirlington's Busboys & Poets is coming on strong with Wolaver's Organic and Peak Organic available. Boulevard Woodgrill in Clarendon usually has at least one organic beer available. At Washington Blvd. & Pershing Drive, Tallula's EatBar carries Samuel Smith Organic Lager, but it's expensive at $11.50 a bottle and not that good. In DC's Dupont Circle, you can find organic beer at Brickskeller and Restaurant Nora, and Peak Organic is now flowing at Rocket Bar, Tryst, Open City, Wonderland Ballroom, J. Paul's, Hook, Oceanaire, Les Halles, Cafe Saint Ex, Busboys, Ulah Bistro, The Reef, and Kramerbooks. At the grocery store, Whole Foods has a good selection, including Wolaver (my favorite: the Wit Bier). Harris Teeter carries Peak Organic's Pale Ale and Anheuser-Busch's organic Wild Hop Lager and Stone Mill Pale Ale. The Trader Joe's out on Route 7 has some local brews but not many organic selections. If you live outside the DC area, the National Geographic's Green Guide has a great review of what's available. Locally-brewed beers have less of an impact on the environment because they don't have to be shipped in from Colorado or Germany, a concept known as food miles. Local breweries include Dominion (in Ashburn) and Shenandoah Brewing (in Alexandria). * Order a draft. Few bars and restaurants have good recycling programs, so your empty beer bottle is likely headed for a landfill. But a pint glass will be used hundreds (if not thousands) of times. * Go with a beer from Anheuser-Busch, maker of Bud, Busch, Michelob, Natty, Rolling Rock, and other beers. Anheuser-Busch is actively reducing its carbon footprint and increasing its use of renewable energy, earning top honors among major breweries in the most recent ClimateCounts.org scorecard. To read more on sustainable drinking, check out Chris O'Brien's Beer Activist blog! Creigh Deeds, Coal Industry Spokesman? Creigh Deeds is a very nice guy that I don't enjoy criticizing. He pushed several good clean energy bills in this year's Virginia Senate and has properly opposed drilling along Virginia's coast. But in an interview last week with Lowell Feld of Blue Virginia, Deeds showed why progressives are turning away from his campaign and towards the clean energy policies of Brian Moran and (to a lesser extent) Terry McAuliffe. Deeds sounds like he's selling coal air freshener. We need to harness the awesome power of the word "clean"! Look, coal is still dirty because no one has figured out a cost-effective way to capture and store its carbon dioxide emissions. Even if that technology does come along, it will add an estimated 25 percent to the cost of producing coal-fired power (which has already gone up 20 percent in Virginia just since September). And that doesn't get into coal's other emissions that include mercury, carbon monoxide, sulfur dioxide, nitrogen oxides, and particulates. We don't need another four years of a governor telling us we can't get off coal and all we can do is sit on our hands, wishin' and hopin' for the day carbon capture and storage comes along. We need to begin to transition off dirty coal & oil and onto clean energy, and we need to start right now. Deeds also fumbled Lowell's question on mountaintop removal, bizarrely beginning his answer by saying "the coal industry calls it surface mining." Huh? Bernie Madoff didn't call his investment firm Ponzi Scheme Inc., but that's what it was. Again, it's hard to imagine a coal industry spokesman answering the question much differently. I like Creigh Deeds. He's still be better on the environment than presumptive Republican nominee Bob McDonnell. But at a time when we desperately need real change on energy policy to save consumers money and protect Virginia's natural resources, Deeds sounds far too much like more of the same. The Green Miles has now been to two "blogger dinners" hosted by Democratic candidates in the Virginia governor's race. One was hosted by Terry McAuliffe, the other by Brian Moran. I went to Terry's because I wanted to hear him make his case for his candidacy. I went to Brian's because if the primary was held today, I'd vote for him. Some bloggers who attend these dinners claim they have absolutely no impact on their objectivity. These blogger dinners are no different than reporters riding John McCain's tire swing. You may not think you're giving up your objectivity, but in this case, as The Rock might say, it doesn't matter what you think. It's perception that matters. Me? I'll happily own up to being in the tank for all of the Democratic candidates for governor. While I may support Brian because he's the best of the three Democrats environmentally, no matter who the nominee is, he'll be vastly better on environmental issues than presumptive Republican nominee Bob "Drill, Baby, Drill" McDonnell. One Person Per SUV is the Rule! I'll admit that I sometimes choose not to participate in this [green choice] program and request fresh towels and sheets every day. Before you write in scolding me for being a wasteful person, let me qualify that by saying it's not the program, in theory, I'm against. I'm all for saving the environment. But I don't want to be guilt-tripped into going green. It's the two-facedness of it that gets me-save our planet! Conserve our resources! It's up to you, hotel guest. Forsake that washcloth (or two! ), or those crisp sheets that are your right when you pay for the room, and to what end-so the hotel can save money on laundry? How many natural resources are wasted printing all of these little signs? Here's an idea: Instead of printing out a placard for every room in the hotel, wash my towel. Pellettieri goes on to claim that any green efforts that also save business money are "eco-not-so-friendly schemes." Apparently, in Pellettieri's world, the only genuine green efforts are ones that lose money? At the bottom of the article, an email form asks, "How are companies taking advantage of you in the name of Mother Earth?" Hmmm. How about by starting blogs called "Green Room" trying to draw environmental readers, then throwing huge hissy fits about the tiniest effort to reduce environmental impact? Maybe Slate should look in the mirror. New LCV Video: GOP With Us or With Rush? In the wake of Dominion Virginia Power’s 18 percent rate increase due to higher fuel costs, the Washington Post reported on Friday that this winter “the utility shut-off service to 93,890 customers for nonpayment, a 15 percent jump from 2007.” Last month, the Virginian-Pilot reported Dominion has added a 1.4 percent fee to all electricity bills to finance construction of its new $2 billion coal-fired power plant in Wise County. It's outrageous that Virginians are losing their heat because they’re being asked to pick up the tab for our Commonwealth’s refusal to break – or even ease – our addiction to coal. Now Virginia faces a triple threat – our energy crisis is deepening our economic crisis while our climate crisis continues to go unaddressed. Fortunately, the same solutions can take steps towards solving all three crises at the same time. We can save consumers money by making their homes more energy efficient, strengthen our economy by creating thousands of green jobs, and preserve our environment for our children and grandchildren by cutting Virginia's global warming pollution. Our leaders in Richmond need to give Dominion new incentives to begin the shift away from coal and towards renewable energy sources like solar and wind power. We’ll need bold action from Virginia's new governor and our next General Assembly to chart a new course towards clean energy. I’ll fight to make that happen. 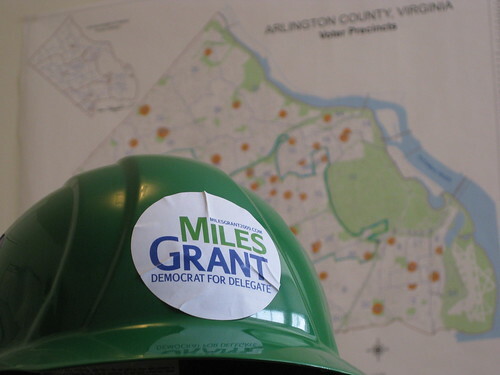 Learn more about my campaign for House of Delegates at MilesGrant2009.com.